Give our Sunshine hat pin to that outdoor lover you know so well. Whether they enjoy a vegetable garden or planting flowers all around or just enjoy walking in the sunshine, we all need to watch out for too much sun. This Sunshine Hat Pin will be a great little reminder to put that hat on and protect yourself from the sun. When you are outside and involved in a project, it is very easy to loose track of time and the result is sunburn and over time that can lead to even greater problems, so the protection a hat offers can be great. Our Sunshine hat pin is layered in a 14Kt gold finish and with a transparent light brown epoxy overlay that makes this hat look like a real straw hat. A purple epoxy ribbon and crystal stones make a great accent color to the natural look of the pin. 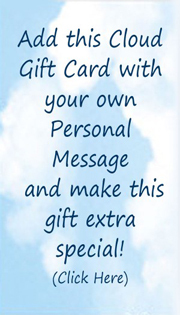 Each pin comes on a colorful greeting card that can be used as a gift card which has a thought provoking verse with a “To and From” on the back so you can sign and address this special gift for that special someone. A little sun can brighten your day. 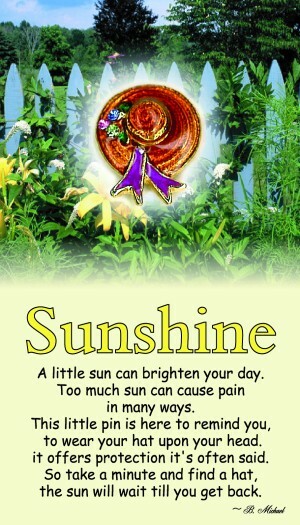 Too much sun can cause pain in many ways. This little pin is here to remind you, to wear your hat upon your head. it offers protection it’s often said. So take a minute and find a hat, the sun will wait till you get back.